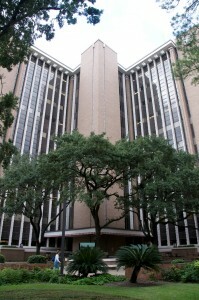 The UTHealth School of Public Health in Dallas was established in 1998 to offer graduate-level courses in Public Health. This academic program is carried out in partnership with The University of Texas Southwestern Medical Center at Dallas. Classes are held on the UTSouthwestern Campus in the UTSouthwestern School of Health Professions Building. The program offers interactive video (ITV) courses that are broadcast to and from the main campus in Houston and the other regional campuses: Brownsville, El Paso, San Antonio, and Austin. The program takes advantage of the outstanding educational and research activities that are characteristic of the UTHealth and UTSouthwestern campuses. Members of the Dallas public health community also provide insight as guest lecturers, consultants, and mentors. The UTHealth School of Public Health offers certificate programs, a general Master of Public Health degree, Master of Science, Doctor of Public Helath, and a Doctor of Philosophy. Faculty at the Dallas Campus examine the particular health problems of a large metropolitan area such as the Dallas/Fort Worth metroplex, as well as issues relating to populations and communities in the north and east Texas regions. The Master of Public Health (MPH) degree is the basic graduate degree in the field of public health. The MPH degree offered at the UTSPH regional campuses covers all five core areas of public health: biostatistics; health promotion and behavioral sciences; epidemiology, environmental and occupational sciences; and management, policy and community health. MPH classes are held at the Dallas campus, via Interactive Television (ITV), and online. Classes are taught by Dallas-based faculty as well as faculty at all other UTPSH campuses via ITV. Access to all UTSPH campuses via ITV gives students a broad perspective of the public health issues across Texas. A PhD in Epidemiology and a PhD in Health Promotion & Behavioral Science degree are available at the Dallas campus. Students in the PhD program develop the necessary skills for a career in academic and research positions. The certificate programs at UTSPH are intended for public health practitioners and individuals considering a graduate degree in the field. The five courses in each of these non-degree certificate programs cover the core content of the specific discipline. Classes are available at each campus and online. Click here for information on the UTSPH Graduate Certificate Programs. Reingle Gonzalez, J.M. (in press). Lessons Learned: Career Challenges in Training the next generation of inter-disciplinary health scientists. Pedagogy in Health Promotion. U.S. population estimates and correlates of sexual abuse of community-dwelling older adults. The Cross-sectional Association Between Severity of Non-Cognitive Disability and Self-Reported Worsening Memory. Cross-Sectional and longitudinal risk of physical impairment in a cohort of postmenopausal women who experience physical and verbal abuse. Towards the Development of a Screening Tool to Enhance the Detection of Elder Abuse and Neglect by Emergency Medical Technicians: A Qualitative Study. Promoting fruit and vegetable consumption among members of black churches, Michigan and North Carolina, 2008-2010. Dallas Social Media-Connect with us! Stop the Bleed is a national awareness campaign and encourages bystanders to become trained, equipped, and empowered to help in case of a bleeding emergency. On Feb. 13, Dallas students participated in a combined workshop that allowed them to become STB certified and also complete Hands-Only CPR (HOCPR) - Basic Life Support (BLS) Training through the American Heart Association. Click on the links below to read about the public health accomplishments of some of our students! Fun Fact: "During my undergraduate studies, I got my EMT license and worked as a medic." Fun Fact: "I am a huge basketball fan. Go Spurs Go!" Fun Fact: "I studied Public Health in college and I plan on getting my PhD in Epidemiology. My passion in life is definitely Public Health!" Fun Fact: "I love cooking and baking, especially when I get stressed out. So hopefully I have people to share the goods with!" Fun Fact: "I have studied five languages-Arabic, Spanish, Turkish, Japanese, and Czech." Fun Fact: “I did a behavioral health mobile tech startup." Fun Fact: "I have a motorcycle license." Fun Fact: "I have a cat named Mitochondria." Fun Fact: "I won my weight class (83 kg) at the 2013 USAPL Collegiate Powerlifting Nationals." Fun Fact: "I was born in Okinawa, Japan." Student resources for the Dallas Campus are administered through The UTSouthwestern Medical Center in Dallas. Canvas is an online system used by faculty to disseminate information quickly and easily to the students. While Canvas is the predominant online system for UTHealth, faculty will inform students if BlackBoard is to be used for the class instead. Students will have access using their Student ID to the UTSouthwestern Library and the online UTSPH Library. Located on the campus of UTSouthwestern Medical Center at Dallas, in the UT Southwestern Medical Center of Health Professions Building, 8th Floor. Dr. Marlyn Allicock is an Assistant Professor in the Department of Health Promotion and Behavioral Sciences. "Our goal is to enrich students' academic, professional, and social lives." Kent Long is an Academic & Admissions Advisor for the UTHealth School of Public Health in Dallas. "Peer support is often the most undervalued resource in our students lives. We are here to help you build that peer support on our campus."